This used to be a traditional essay subject given out at the start of the new school year. I always thought it rather a mean idea to ask us to recall days of freedom and exploration once we were confined to a classroom for the foreseeable future. But there it was. This year I haven’t had a Summer holiday in the going away sense, but I have enjoyed some heart centred animal connections. One of which was so moving, so outstanding and so heartwarming that I’d like to share it. With my nieces, we’d been out walking and had come across some strikingly handsome sheep. We were all attracted by their chocolate brown coats and bi coloured, chocolate and white tails. Naturally we didn’t have a phone between us so couldn’t take any photos. I now know that these are Balwen sheep, a small Welsh breed and totally adorable. I went back, with my phone the next day. I took several photos, had a walk and on the way back stopped by the field to admire the sheep. One of them, a ram about 4 years old walked over to where I was standing by the fence. As I squatted down to get a better look at him, he suddenly thrust a hoof into the palm of my hand and as he splayed his toes, I could see he was showing me a sore place right in the join of his toes. I thanked him for trusting me and the healing began to flow for him. He stood there, on three legs, resting the weight of his hoof in my hand for some minutes. 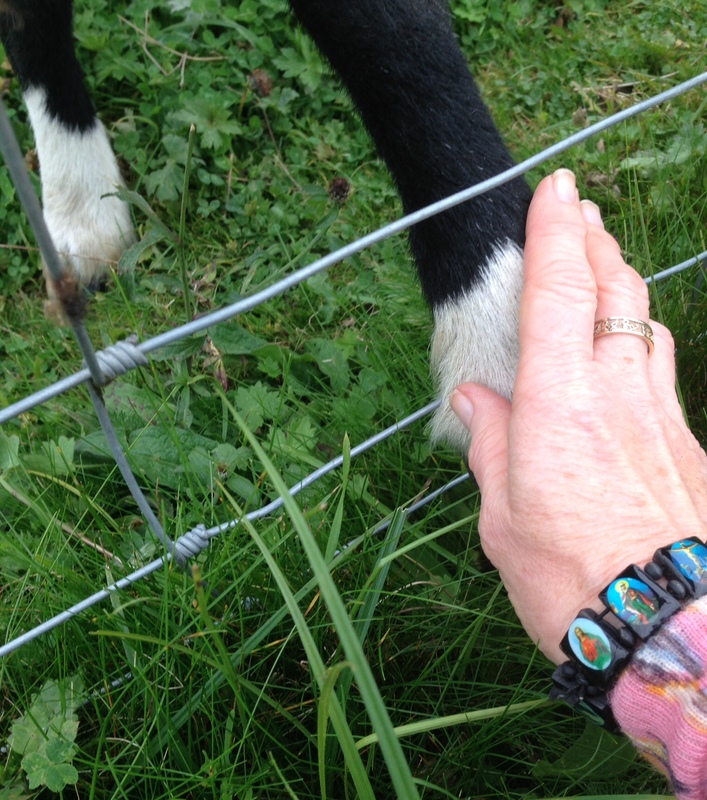 Then he lifted the hoof, tapped me on my hand as I placed my hand over his hoof, for another spot of healing. When he’d had enough, this amazing animal stood and looked into my eyes for a while before walking away. The next day, he came from the middle of the field, straight up to me, banged his hoof on the wire fence and thrust his hoof into my hand again, he wanted some more. I loved it that he was so determined to get what he needed, rams are forceful animals after all. The next day, I was given his name, and so we grew even closer. I was so grateful to be able to help him and blown away by our connection. Sharing this time, this healing and this complete heartfelt trust, is one of the highlights of my life, not just of this Summer. All love and thanks to you, darling George.